A well designed and correctly installed garden has a long term investment for your property and can add as much as 10% on the overall asking price. An experienced designer will have a wealth of accrued knowledge on materials, construction methods as well as great site-specific horticultural knowledge. An imaginative but realistic designer will be able to take your brief and translate it into the garden you desire, on budget. A thoughtful, creative design will enhance your well-being and enjoyment of your home, for you and your family. Tabitha Tarling Garden Design offers a full design consultation service, as well as overseeing the full installation of the proposed garden, using local experienced and professional landscaping companies, both in the south west and in London. This can include site analysis, presentation drawings and image boards, construction drawings where necessary, lighting plans, planting plans, specification and tender documents. 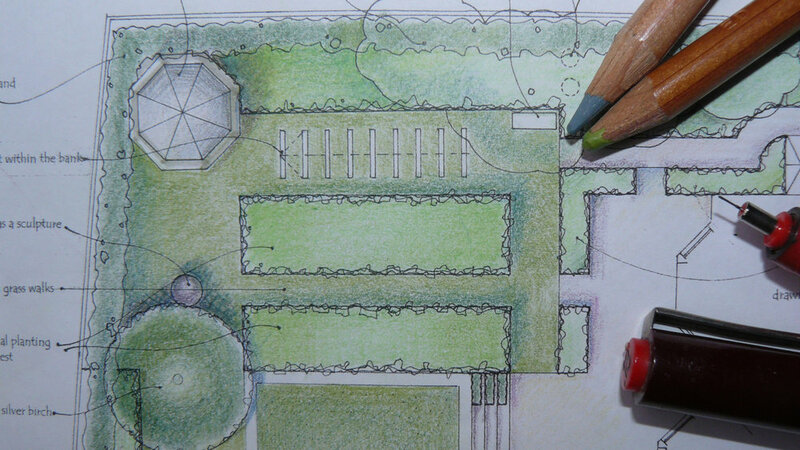 If required I can also provide 3D sketches of any garden proposal. Selecting the right contractor for the job is hugely important in order to get the garden you want. I can provide complete project management to ensure the build comes in on time and on budget and to the correct specification by way of contractor liaison, regular site visits and ordering of materials. I sign off any major design elements and provide a snagging consultation with the contractor and client at the end of the build. I can provide either a full re-vamp for your garden or help with selecting a few choice plants to re-invigorate certain areas which look a bit tired and overgrown. I provide full planting plans with numbers, varieties and correct spacing. I provide detailed full colour image boards of all the proposed plants, as well as a brief description and basic care guide. I will also source and quote for all plants. I also offer a full planting service, with delivery of all plants to site, as well as any after-care for your garden as required. I offer ongoing horticultural advice all year round. All gardens, however minimal the planting, will require some maintenance throughout the course of the seasons. I offer specialist pruning for smaller trees and shrubs, herbaceous border care, as well as tidy ups. Fees are tailored to individual projects, based on the client’s requirements. I also do onsite hourly consultation work, to give design and horticultural advice, should you not require a full design. This is £45 an hour, depending on your location. Please contact me for more details and we can chat through your requirements.